Intending to continue the last month’s Mustang profile collection (Part 1 show a selection of P-51s in the U.S. service – Ed. ), I’ve been looking through my collection of RAF and Commonwealth Mustang profiles (in fact the only Commonwealth squadrons that operated Allison Mustangs were Canadian, so you could say RAF & RCAF). There were so many variations of the Allison-engined ones that I decided to devote this month’s article to them exclusively . The readers will see as the story unfolds why I decided to do so. I regard the Mustang as probably the best physical example of Anglo-American co-operation ever: designed to a British Air Ministry specification by an American company and then later mated with a superb British engine to produce what was arguably one of the best fighters of all time. From the start, after initial trials, the RAF decided to use the Mustang in the Tactical Reconnaissance role with its Army Co-operation squadrons as a replacement for the Curtiss Tomahawk; strange to think that, via the latter, the Mustang took over the former role of the Westland Lysander! There were three different ones: Mk I, Mk IA, and Mk II, the basic difference between them externally being the armament. The Mk.I had six .303 Browning machine guns, two projecting from the underside of the nose and the other four in the wings; the IA had four 20mm cannon; and the II had four .5 calibre Brownings in the wings. The only reason that the number of RAF tactical reconnaissance squadrons with Mustangs diminished to only one by the end of WWII was not because of any deficiency in the aircraft, but simply due to attrition of an aircraft that was no longer in production. The aircraft that replaced it (Typhoons and Spitfire fighters fitted with cameras) were not so good in that low-level role. The Allison Mustang still was one of the highest performing aircraft at low altitude right up to the end of the war, and besides its role in reconnaissance scored quite a number of victories as a fighter in the process. The profiles follow in chronological order starting with this Mk.I of 241 Squadron. The Mustangs were delivered from North American already painted in very close US equivalents to RAF Dark Earth, Dark Green and Sky, just as shown here. Where they differed from normal RAF practice was in the brown painting of the propeller spinner and the sizing and position of the fuselage roundel. Also they were painted as complete aircraft before dismantling, the parts being put into crates for shipping to and reassembly in the UK. Unfortunately the crates were not marked with serial numbers, so parts from different original aircraft got assembled on arrival and this resulted in camouflage patterns that didn’t match up, and so the paints were touched-up to make them match as well as possible. What this means is that there was a great deal of variation in camouflage patterns, roundel and serial number positions and sizes on fuselage, so the modeller is back to needing to check on photographs for any one particular aircraft. Officially the Mustangs should have been repainted in the later grey/green colour scheme introduced in the summer of 1941 right from the start, but quite a number retained the brown/green for some time after entering service like this one. The most unusual feature of 241 Squadron’s early Mustangs was the method of presenting the code letters all in one block of three letters; the Squadron code was ”RZ”, the ”W” being the individual letter on this a/c. Also, of course, these aircraft should have had the standard Sky coloured spinners and fuselage bands, but they have not been applied. Note also that the obliquely facing cameras have not yet been installed in the rear of the cockpit. This aircraft has the original type of radio antenna and engine exhausts: both of these features were modified later on the British Mustangs. 241 Sqn first got Mustangs in April 1942 and only kept them until November, when it moved to North Africa for Operation Torch and re-equipped with Hurricanes, still in the Tac/R and ground attack roles. This Mustang I shows the standard finish adopted for RAF fighters from August 1941, the main differences being the replacement of Sky undersides with Medium Sea Grey, and the Dark Earth on the upper surfaces with Ocean Grey. However, as is so often the case, matters were not quite so simple as that. Pending sufficient supplies of the new proper shade of Ocean Grey, aircraft were painted with a so-called ”Mixed Grey”. This latter colour was officially to be mixed from seven parts Medium Sea Grey with one part of Night (black); however, as photographs confirm along with contemporary reports, this mixing was not done so precisely and varied a lot. The official mixture would have resulted in a shade very similar to Dark Sea Grey; but there were a range of shades that actually were used: some aircraft even simply had Medium Sea Grey with no black at all mixed in. It is perfectly understandable that in wartime conditions on operational units, when aircraft were being lost at frequent intervals as well, that the precise mixture of a paint colour was hardly of the greatest priority. This particular Mustang shows the darker shade similar to Dark Sea Grey. The Sky spinner, 18 inch fuselage band, and code letters have been applied, along with the yellow wing leading edges which were introduced with the new colour scheme. As to the aircraft itself, note that this one has the oblique camera mounted in the rear cockpit facing to the left, and also it has a rear view mirror on top of the windshield. The latter point is something else that modellers should always check when making Allison-engined RAF Mustangs. The exhaust stacks remain in their original condition as does the radio antenna. This right-hand side view shows a peculiarity of the Mustang in that it had its pitot tube under the right wing; the vast majority of fighter types had them under the left wing. This Mustang I of 2 Squadron shows the markings modifications introduced on RAF fighters in July 1942 to the roundels and fin flash, with the narrow (2 inches) white and yellow rings/stripes. On this particular aircraft the upper surface grey remains the Mixed Grey previously described, otherwise the camouflage is the standard Dark Green on top with Medium Sea Grey undersides. On this aircraft the roundel is the standard size 36 inch diameter, as it was on all Mustangs after the introduction of the new style; however the position of the roundel on the fuselage continued to vary considerably right up to the end of the war, as did the serial number which also continued to vary in size and position quite a lot. There was always a problem with the Mustang in the European Theatre in that it closely resembled the Messerschmitt 109 in shape, as a result of which various types of special recognition markings were tried out by both the RAF and USAAF. Quite a lot of RAF Mustangs, like this one, had the yellow leading edges of the wings extended all the way in to the wing root fairing. It should be borne in mind that their main role was to co-operate with army forces at low altitude which made them vulnerable to friendly ground fire, so from head-on view the extra yellow helped at least a little as a recognition aid. Also note the white name ”Eileen” just ahead of the cockpit canopy; this was a common feature on 2 Squadron’s Mustangs (and also their previous Tomahawks) that there was a girl’s name starting with the same letter as the individual aircraft code letter painted in white like this (eg Tomahawk XV-S was called ”Suzanne”). This aircraft is fitted with the oblique camera in the rear cockpit but the perspex window has been replaced by a metal piece with a hole in it for the camera to point through; the latter was a fairly common modification on Allison Mustangs. The engine exhausts and radio antenna remain as original on this aircraft. 2 Squadron operated Allison Mustangs of all three marks at various times from April 1942 until January 1945. This Mustang is a real anomaly of non-regulation markings. Very nearly a whole year after the order was given to repaint fighter aircraft in the grey/green finish this one still retains the Dark Earth and Sky colours. In spite of this however it has had its roundels and fin flash modified and also has its Sky band on the fuselage, but the spinner remains Dark Earth! It also has the standard style of yellow leading edges which were introduced with the grey/green colour scheme; also the code letters are in Sky, not light grey. This aeroplane is also a good illustration of how the roundel position on the fuselage varied so much, resulting in this instance with the individual aircraft letter having to be placed on the nose as there is no room for it behind the roundel. The panda head on the nose is an individual pilot’s marking; it is not known whether it appeared on both sides. As to the aircraft itself, note that this one has a rear view mirror; the exhausts and radio antenna remain as original. Also the camera is fitted but the perspex (with a hole cut in it) remains on the left side. 613 Sqn flew Mustang I’s from April 1942 until October 1943 when it became a Mosquito VI fighter-bomber squadron for the rest of the war. This Mustang I of 169 Squadron shows the Mixed Grey / Dark Green / Medium Sea Grey finish together with some other markings differences. Note that on this aircraft the Sky band has been painted somewhat further forward together with the serial number; something else that varied sometimes on Allison Mustangs. Also the roundel is very low in position and right close up to the serial number. The spinner is the regulation Sky of course but the camouflage pattern is not a usual one compared to other single-engined fighters on the rear fuselage and vertical tail (normally it would be Dark Green across the fin/rudder where the grey is and vice-versa). Next we come to the yellow markings on the wings: again we have the full-span leading edges and also added are the chordwise 12 inch bands top and bottom which were ordered as a special recognition marking for RAF Mustangs from 1st July to 2nd December 1942. From about the autumn of 1942 the RAF’s tactical reconnaissance squadrons based in Northern Europe ceased to use any squadron identity letters and so, as with this Mustang, only had the individual aircraft letter in Sky. This aircraft still has the original type of radio antenna and engine exhausts, and has a rear view mirror and the camera in the rear cockpit. Another thing to notice on all the Allison Mustangs are the three small louvres on the rear right upper engine cowling; these were not on the left side – only the right. 169 Sqn was formed with Mustang I’s on 15 June 1942. It carried out shipping reconnaissance, ground attack, and fighter defense against low level attacks by Luftwaffe fighter-bombers, but was disbanded on 30th September 1943. A new Mosquito night intruder squadron was formed the next day with the same number. The airfield used at Doncaster was before the war, and still is, a famous horse-racing course. A very unusual colour scheme can be seen on this Mustang I of 400 Sqn. The upper surfaces are camouflaged in Dark Green and Mixed Grey with all black undersurfaces; however, as you will see, the camouflage pattern has been much modified by further covering various areas with Dark Green. The original roundel has been overpainted and moved while still as the thick-ringed Type A1, hence the strange green pattern ahead of the new one and also a whole patch of grey has been painted over with green around the cockpit area, perhaps to make the whole nose darker. The reason for this dark colour scheme is that 400 Sqn were employed on ”Night Ranger” missions over occupied Europe around this time, at the same time as performing other types of fighter and reconnaissance operations. They were quite successful in shooting down enemy aircraft. 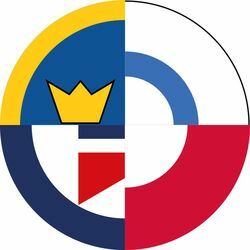 To return to the roundel itself, note that it is a rather crude conversion of the earlier type and the proportions are quite inaccurate, the blue in particular being too thick and the red centre too small. In spite of all the dark painting the sky spinner, fuselage band, and codes are retained, along with the full-span style of yellow leading edges to the wings. Also the tops of the wings still have the 12 inch yellow bands over them. The aircraft is in original condition in every respect, but is not fitted with the camera in the rear cockpit; it would not be necessary for night fighter/ground attack missions. 400 Squadron RCAF flew the Mustang Is from April 1942 until February 1944, having commenced re-equipment with unarmed reconnaissance Spitfires and Mosquitos in December 1943. This 16 Squadron Mustang I is the first in this series to show how the aircraft were gradually modified in service. The radio equipment is changed so there is no aerial wire anymore, just the original mast with its small attachment point at the top. Then the exhausts from the engine are of the later type, wider and flatter at the rear than the original type. The aircraft is painted Dark Green and Mixed Grey on top with Medium Sea Grey underneath; the spinner, fuselage band, and code letter are all in Sky, and the yellow recognition bands appear around the wings and full-span on the leading edges (incidentally the leading edges were 6 inches at the inner end and narrowed towards the wingtips). The roundel is in a fairly normal sort of position, allowing room for the code letter to be placed behind it and the fuselage band is right back against the tailplane. The camera is fitted in the rear cockpit. 16 Squadron first got its Mustang Mk. Is in April 1942 and kept them until November 1943, having started to re-equip with unarmed Spitfire PR Mk. XI reconnaissance aircraft in September 1943. This Mustang I of 309 (Polish) Squadron has a most unusual colour scheme, but then as I said before there were many variations. In this instance the upper surface grey areas have simply been painted with the same Medium Sea Grey colour as the underneath, without adding any black mixture at all. But to confuse matters more, parts from another aircraft have been used to make repairs: the upper engine cowling panel in Dark Green looks very odd and also the trim-tab on the rudder is from another aircraft. The roundel is quite far back and low down in position, and this is emphasised even more by the Sky band being quite far forward. This has also resulted in the serial number position relative to the band appearing odd and also the code letter having to be placed ahead of the roundel. The yellow wing leading edges on this aircraft are of the normal type, only extending from the tip to the outboard gun port, and not going the full span of the wing. Also there are no yellow bands around the wings. The Polish Air Force marking of course is on the nose, and the spinner is the usual Sky colour. This aeroplane, like the last one has the modified radio with no aerial wire and also the later type of flame damping exhausts. The camera is fitted in the rear cockpit. 309 Sqn used Mustangs I and IA from July 1942 until February 1944, when it converted to Hurricanes until October 1944, at which time it re-equipped with Merlin-engined Mustangs III and IV. The Squadron served at Findo Gask in Scotland from November 1942 until March 1943, operating mainly on shipping reconnaissance missions. Here is a most interesting P-51 Mustang of 225 Sqn ”borrowed” from the 12th USAAF in North Africa after Operation Torch. This Squadron had flown Mustang I’s in the UK alongside Hurricanes working-up in the Tac-R role in preparation for the move to invade Western North Africa; when it moved there it only took Hurricanes. By the beginning of 1943 it was reduced to borrowing Spitfires from Nos 93 and 111 Squadrons for the Tac/R work and using its few remaining Hurricanes for ground attack with bombs. Due to 225’s severe lack of Tac/R aircraft of their own the 12th AF was ”unofficially” approached for the ”loan” of some P-51’s and a few were received. These aircraft were not allocated RAF serial numbers, retaining their US serials (four that are known are 41-137361, 41-137366, 41-137424, and 41-137428) but these were apparently painted over during re-camouflaging in RAF paints. As can be seen the aircraft is a standard US P-51 model including the rear cockpit equipment, and of course four 20mm guns in the wings. The camouflage is reported as being the standard RAF Mid Stone and Dark Earth on top with Azure Blue undersurfaces. The fuselage roundel is a crude adaptation of the original USAAF star marking and full squadron codes are carried in white. The propeller spinner is the standard Mediterranean Theatre red; also note the yellow outboard leading edges on the wings; this was a common feature on many desert painted RAF fighters. 225 Squadron operated these few ”borrowed” aircraft from April to July 1943, after which it was completely equipped with fighter reconnaissance Spitfires. This is a second, later, Mustang of 400 RCAF Squadron,showing some differences from the earlier one. The unit code letters have by now been abandoned but a maple leaf insignia on a white disc outlined in blue, very similar to the Canadian roundel adopted in post-war years, has been put on the nose. The camouflage colours are still the Mixed Grey and Dark Green uppers with Medium Sea Grey underneath. Note, however, that an all green rudder taken from another aircraft has been fitted as a repair replacement. The other markings are all standard: Sky spinner, code letter and fuselage band (though the latter is a little further forward from the tailplane); plus the normal yellow wing leading edges from outboard gun to wingtip. This aircraft has the later type of engine exhausts and the third variety of radio antenna – note the extra pointed mast below the nose. The camera is fitted. Also, by this time the rear view mirror has become a standard fitting. Here a Mustang with two significant differences as compared to the previous one. Firstly it is a Mk. IA with the four 20mm cannon armament; and secondly it is painted with the proper shade of Ocean Grey on the upper surfaces along with the Dark Green, the undersurfaces being the standard Medium Sea Grey. The markings are also as per regulations including the Sky spinner, code letter, and fuselage band. Note that the serial number is positioned below the tailplane; this was usual on the Mks IA and II as well as the RAF’s Merlin Mustangs. As to the aircraft itself, note that the additional aerial below the nose is not fitted; the camera is in the rear cockpit. The red front pieces on the cannon are dust covers which slid over the muzzles and were shot away when the guns were fired. In earlier times before such specially made covers were available, RAF cannon armed aircraft frequently had condoms put over the gun muzzles to keep out the dust! 170 Squadron first got Mustang I’s in June 1942 and exchanged them for the Mk.IA in August 1943. The unit was disbanded in January 1944, being reformed in October 1944 as a Lancaster Squadron. A stang Mk. I with D-Day stripes. Most of the Tac/R Mustang units on D-Day did not apply the full set of stripes, in particular they were not painted on the upper surfaces. The reason for this lay in the nature of the work they performed, flying at very low altitudes over very heavily defended enemy troop concentrations, either as single aircraft or in twos. Hence they did not wish to impair their camouflage against any terrain they might use for concealment. In spite of this, these Tac/R squadrons suffered the highest losses of all RAF units in the month following D-Day, mostly due to German ground fire. The task they performed was invaluable to both Army and Air Force units; and also Naval ships bombarding targets from off-shore. There were a number of variations in the application of the stripes on the Allison Mustangs, so again it is really a question for modellers to have an illustration of any particular aircraft. This one has the full set of stripes on the undersurfaces with the rear white band on the fuselage right up against the Sky band and going all round the top as well; also notice that this rear band slightly overlaps the yellow of the roundel. The rest of the colouring is normal for this later stage of the war, with Ocean Grey and Dark Green uppersurfaces and Medium Sea Grey undersides; Sky spinner, code letter and fuselage band, with yellow leading edges to the outer wings. Also note that these late Mk.I’s had the serial number painted under the tailplane like the later marks. The aeroplane itself has all the later features introduced except for the aerial under the nose. 168 Sqn was one of the first RAF Sqns to move across the Channel to France after D-Day, initially flying partly from temporary landing grounds in Normandy as well as from Southern England until the whole unit moved into Sommervieu on 29th June. The squadron operated Mustangs until October 1944, starting re-equipment with Typhoon FR.IB’s in September. Here we have a cannon armed Mustang IA with D-Day stripes showing how their application varied as compared to the Mk.I above. In this instance the under fuselage stripes are further back, overlapping the Sky band considerably with the last white stripe, which also does not go right round the fuselage. Again, there are no stripes on top of the wings. Otherwise the camouflage and markings are just as the last aircraft exactly, as is the modification state of the aeroplane itself. The gun muzzle covers are a very light colour, probably yellow as shown. There has been a certain amount of confusion in various publications between Nos 168 and 268 Squadrons at the time of D-Day; there is no doubt that at that time 168 had the Mk.I Mustangs and 268 had Mk.IA. Although 268 Sqn kept some Mustangs, including a few Mk II’s until 1945, these were supplemented by Typhoons between July and December 1944 and the unit converted entirely to Spitfire XIV’s in April 1945. This is the only Mustang II in this selection; out of the Allison Mustangs supplied to the RAF only fifty were Mk.II’s, with the uprated V-1710-81 engine and four 0.5 calibre guns, and serial numbers FR890-FR939 (the great bulk of Allison Mustangs were Mk.I of which there were 520, and there were only 92 of the IA’s). The colour scheme of this Mk.II is as standard: Ocean Grey / Dark Green upper surfaces with Medium Sea Grey undersurfaces, plus the normal Sky and yellow trimmings. The D-Day stripes are only on the underneath and those on the fuselage only have two white stripes with the Sky band replacing the third. Also notice that the roundel is positioned a long way back. This aircraft also has the extra aerial under the nose. 2 Squadron operated all three Allison marks of Mustang, converting from I’s and IA’s to the Mk.II in May 1944. The unit re-equipped with Spitfire FR.XIV’s in November 1944 and gave up its last Mustang in January 1945. This Mustang I of 430 Sqn RCAF was badly damaged on the ground on 1st January 1945 in the German attacks on Allied airfields (Operation Bodenplatte). Such losses on that day were quite considerable and as far as the Allison Mustangs were concerned they were irreplaceable to an already dwindling number. As can be seen, yet again we have the standard camouflage and markings colours (which I won’t bore you by repeating yet again) with the D-Day stripes by now only applied to the underside of the fuselage. Also all the later modifications, including the aerial under the nose, are present. The last of this series of RAF Allison-engined Mustangs shows one of the Mk.I’s that 26 Sqn were re-equipped with for the second time from December 1944 to June 1945. During this time the Squadron was based mainly at various airfields still in England, except for a brief period at Cognac in France in April 1945, for reconnaissance missions over the Netherlands. The period spent at Cognac was for the purpose of co-operating with French warships bombarding targets near Bordeaux. Hence the aeroplane is painted in all the standard RAF fighter camouflage and markings for that time, and, of course, most noticeably the reinstatement of Squadron code letters, albeit in a slightly smaller size than usual. The aircraft is in final form with all the modifications that were made from the Mk.I’s as they originally appeared. So, as mentioned before, 26 Sqn were both first (January 1942) and last RAF Squadron to operate the Allison Mustang, re-equipping with Spitfire XIV’s in June 1945. This article was 2000.originally published in IPMS Stockholm Magazine in January 2000.